Bad news if you're one of the many people who believe Friday the 13th is unlucky. There are two of these days this year, and the first one is TODAY. While little is known around the origins of the superstition, a fear of this day is more common than you might think. It's even been given two scientific names—friggatriskaidekaphobia or paraskevidekatriaphobia—in recognition of the widespread phobia. 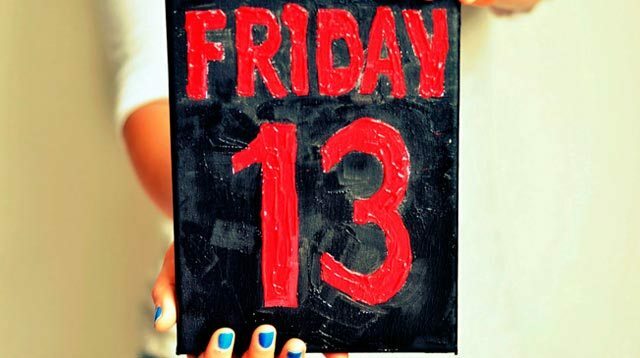 There are a number of theories to suggest why Friday the 13th brings bad luck, including the idea that it's unfamiliar and irregular in comparison to the even number 12. (There are 12 months of the year and 12 hours on a clock, after all). Others have linked it to the Last Supper, when 13 guests were present at the table with Jesus, the day before his crucifixion on Good Friday. This has contributed to the belief that Friday is an unlucky day and 13 is a particularly ominous number. "The ideas that Friday was unlucky and that 13 was unlucky were both around long before the idea that combining the two was especially unlucky," Christopher French, a psychologist at Goldsmiths University told Cosmopolitan. "This belief did not appear until the late Victorian era. No one knows for sure why Friday is unlucky, but it has been suggested that this is based upon the widely held (but mistaken) belief that the Last Supper was held on a Friday. Similarly, some hold that the number 13 is unlucky because this was the number of diners at that fateful meal." Despite the mystery surrounding it, a fear of Friday the 13th is said to be endorsed by around 10 percent of the population in the Western world, and it has influenced a LOT of areas in our lives. Hotels have been known to skip 13 and go straight to 14 when numbering floors, and houses often do not have a number 13. According to Bloomberg, less than 10 percent of Manhattan apartments with 13 or more stories actually label a floor with the feared number. Councils in the UK have also been known to avoid building new premises with the number 13. In reference to the Biblical origin, many believe it's also unlucky to have 13 people around a dinner table, while others avoid getting married on the notorious date (which could actually make a wedding on this day cheaper). Of course, the scary events that have happened on Friday the 13th in the past don't help things much. Over the last 50 years, these have included a plane crash in the Andes, an unforeseen cyclone in Bangladesh, and a boy who was struck by lightning at 13:13 (or 1:13 p.m.). However, experts suggest these events do not explain the paranoia, as there's absolutely no data to suggest Friday the 13th is more dangerous than any other day. "It is not supported by any convincing empirical evidence but is maintained and passed on because superstitious people tend to notice and remember bad things that happen on this particular date," French explained. Still, with the second Friday the 13th due in October (AKA the ~SpOoKieSt~ month, obvs), it's likely the fear will last for some time to come.